← Jahfa Culture – ‘Revelation Time’ 12″ OUT NOW! Lovers Rock is a romantic, soulful style of reggae that originated in London in the mid 70′s, and remained a popular alternative to the militant roots reggae style until the late 80′s, when both roots and lovers rock mainly gave way to dancehall. The Lovers Rock sound remains popular amongst the generation that grew up going to blues dances (house parties) that played lovers rock and soul until the early hours (commercial radio ignored reggae). 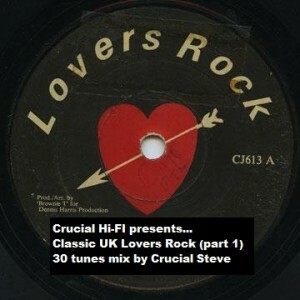 This vinyl-only DJ mix from Crucial Steve features 30 Lovers Rock tracks, covering the period 1978 to 1988. Crucial Steve and his sound Crucial Hi-Fi are based in NW London. If you are interested in booking, please message me via the Contact Form.